It's way too late and I'm way too tired to post anything, but I will hopefully say something about Comic-Con before the week is over besides: "It was good. Very good." I'll possibly even have some photos uploaded, but I'm not making any promises. I will say that my favorite thing I picked up this year is a little book called Todd and Penquin: embrace your inner dork. P.S. Thanks again to the lovely Palmers for the cut! 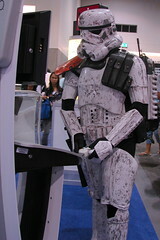 I've been coming to the San Diego Comic-Con for several years now. It all started a long time ago when E dragged me, kicking and screaming, to the show for a day. Since that first time, I've really embraced my inner geek and have come to enjoy what is now an annual event for us. Most people who read here probably know that not only do I now love Comic-Con, but that I am also exhibiting in the Small Press area for the second year in a row with the Tired Girl Collective. Over the years, I've learned that a good portion of the attendees are sweaty fanboys. So, it makes sense that most exhibits are geared toward guys, with their robots, action figures, superheroes, and scantily clad booth girls. What's a nerdy girl to do? We intentionally made our table pink, in hopes of attracting the girly contingent and it has worked. Over and over, women and girls get excited when they see an adorable homemade hamster or precious note card. A pretty consistent reaction at our table is, "Oh my god! That is so cute!," which is exactly what we were going for. A lot of the she-nerds who visit have a somewhat tentative dork boy in tow. It's fun watching them enjoy the pink, girly oasis we created in the sea of testosterone. If you want to see more of our wares, go to the Tired Girl Collective site. 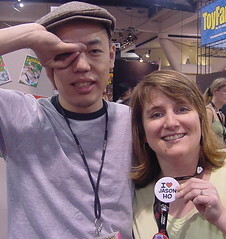 For the 2005 Comic Con, I made buttons that said, "I *heart* Jason Ho." Why? I think there was a joke at the '04 show about making shirts that said that and well, it turned into buttons. He didn't know about it until he noticed all of his friends wearing them. For those of you wondering who he is, Jason Ho is a talented artist who works for Bongo Comics. He is also probably the biggest Transformers fan in the entire world. Jason wrote an extensive blog post promoting his work, as well as that of Big Boss Comics and the Tired Girl Collective and what we are all bringing to this year's Comic Con. See why I *heart* him? I feel like I've finally made a fair amount of progress toward being ready for this year's San Diego Comic Con. I've been making buttons and hamsters like crazy. There are tons more to make, but I'm finally feeling better about it all. The things I ordered via the mail have all arrived. * I think I just need one more trip to Michaels and I'll be set. Of course, there are the daunting tasks of laundry, packing, and cleaning the house hanging over my head. And, one of the dogs has had diarrhea all day, which has lead to several unplanned trips to the bathtub. So, I'm taking a little break to write here, shower, go to some friends' joint birthday party, and possibly an open house at a theater. After that, I'll burn the 3-4am oil again and cut, glue, and press like nobody's business. The point of this was to tell any of you reading this who will be attending 'Nerd Prom' next week, to come by the table I'm sharing with a group of creative and talented women to say hi. 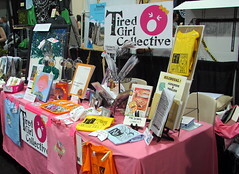 We are the Tired Girl Collective and can be found at table N4 in the Small Press area. After countless explanations of the whys and whats of Comic Con to my less nerdy co-workers, I was interested to see an article on the event in this week's Entertainment Weekly. As if it wasn't crowded enough! I'm actually really excited about Comic Con as it's always lots of fun with excellent people watching opportunities. Like last year, I'm excited to meet at least one, if not more, friends I've made through the bloggy world. *Apparently, I'm not such a good nerd. Or I'm just cheap. I pre-ordered my Harry Potter book months ago, but chose a shipping option that will get it to me by Monday at the earliest. 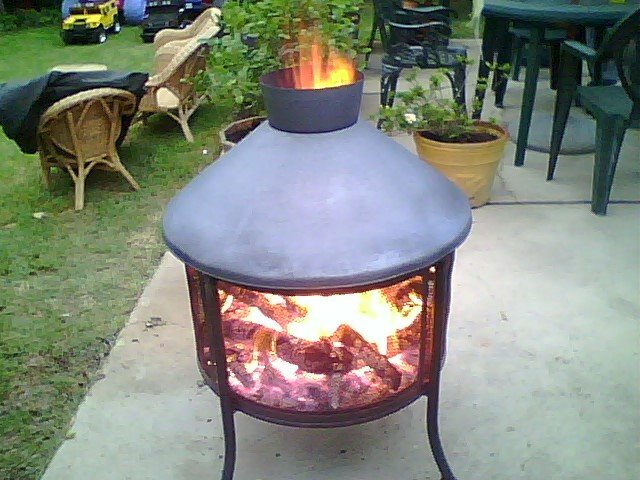 It will potentially arrive when I am away in San Diego. Not that I really have time to read right now. **4:15pm: My book actually arrived and yes, I did a happy dance. I'm not opening it yet, in fear I'll not do anything else! Two years ago today, I started you. 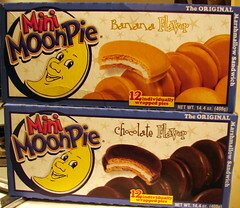 Lately, I have really neglected you and for that, I apologize. It will only get worse over the next week or so as I cram to get ready for and then attend Comic Con. Be patient, dear Snarky Dork Blog, and I will catch up soon. I did have three requests for more on recent concert experiences, so I'll go with that for now. Seeing The Police live, TWICE, last month was absolutely a dream come true. I mentioned before that I'd wanted to see them live when I was in 6th grade. I wasn't allowed to go and by the time I was in 8th grade, they disintegrated. I remember where I was at school when a friend brought me a tiny piece of the newspaper that told of the split. I cried. I discovered I still have that scrap, glued in a memory book. I was overjoyed to learn that the lads were reuniting and touring this year. We splurged and got tickets to both L.A. shows. Who knows if we'll ever have this opportunity again. I'll get the negative stuff out of the way and say that I really had only two complaints and those are: 1) Due to the hugeness of the band, they did arena and stadium shows and 2) They played the same set list both nights. I supposed I've become fairly spoiled living in L.A. and seeing great performers in fairly intimate venues. Also, with such a vast catalog, I'd hoped for a little more variety. But, I feel pretty lucky just to have seen them at all, so on to the good stuff. The first show we attended was a Wednesday night at Staples Center. Since we'd already gotten really good seats for the second show, which went on sale first, we got seats that were sort of behind the stage, but off to one side. They actually turned out to be pretty good seats. There were the requisite video screens and the band played to the back quite a bit too. Also, all those years of yoga have paid off for Sting and the rear view, with him in his tight black punk pants, wasn't too shabby. But I digress. From our seats we actually had a pretty excellent view of Stewart Copeland, who is a fun and energetic drummer to watch. There were a couple of songs where a huge array of percussion instruments rose up from underneath the stage and he stood to play them. The band was pretty tight and played a wide variety of their catalog. I've read complaints that they "changed" some of the songs. None of that bothered me and honestly, if I wanted to stay home and just listen to the cd, I would have. A few of my favorites that they did were "So Lonely," "Can't Stand Losing You," "Truth Hits Everybody," and "The Bed's Too Big Without You." Even though I was very excited, I maintained my cool, until they launched into "Every Little Thing She Does Is Magic." I just started crying (Stingjaya! ), but quickly got over that and back into the music. I had a blast at the show and was really looking forward to the one coming up on Saturday, where we'd have a front view of the stage. The show on Saturday was at Dodger Stadium. In spite of being across town at the L.A. Film Fest earlier in the day, we managed to time things well and got there while there was still plenty of parking. Apparently, latecomers did not fair so well. We had missed the opener at Staples, but got to see Fiction Plane, fronted by Sting's son Joe Sumner, perform. They were pretty good. Even better though was the second opening band, Foo Fighters. I've heard good things about their live shows. They were fantastic and really got the crowd pumped. In spite of the same set list, I thoroughly enjoyed the second show as well. I thought it sounded a bit better. E disagrees, but I'm sort of tone-deaf, so who knows. Also, the audience seemed a little more energetic. One of the things I loved about both shows was that it was just the three musicians...very minimalist. No extra players, no backup singers, just The Police. The way it should be. I did manage to sneak my camera into Dodger stadium. While our seats were good, we were a good distance away based on the layout. I got a few decent shots, but mostly took photos off the screens. I am way behind in getting my photos up on flickr, but there will be a set of The Police. I may, in time, get to others' requests. I also may disappear as I madly scramble to get stuff ready for Comic Con. The url for this blog has changed! Update your links and feeds. E and I were picking up some dinner for ourselves and some friends. I asked for extra napkins and said, "We're going to the Hollywood Bowl." One of the two guys helping us said, "Oh, who are you seeing there?" I replied, "John Williams," and was greeted with blank stares and questioning nods. One of them asked, "Who?" "He's a composer," I explained. "He's done the music for lots of movies you know, such as Star Wars, E.T., Raiders of the Lost Ark..."
They nodded, sort of knowingly. Although I wasn't sure they did know and was wondering what bizarro world I'd landed in. The guy then excitedly asked, "So he made that Darth Vader theme?" He chuckled and said, "That plays on my phone whenever my Mom calls." I can't make up stuff this good, people. *Because no one would ever wear a Star Wars shirt otherwise, right? This is not the post I promised, but just an amusing anecdote. I said, "Are you Susan?" She looked surprised and a bit hesitant, but said, "Yes." So, to clarify, I asked, "Are you 'smalldogs*'?" (Apparently, she almost peed in her pants at this point). She affirmed and asked who I was. She smiled and hugged me, yes, there in the ladies room, and we chatted about our dogs until it was our turn to enter the stalls. *smalldogs is not only one of my longtime flickr contacts, but she is an amazing photographer who I'm inspired by often. She also seems really cool in person and has great taste in comedy. If there is anyone even still bothering to check in here, leave me a comment about something I did in the past few weeks that you want to know more about. There are a few photo clues in the posts below. Whatever gets the most responses will be my next subject. And if no one is interested in anything, then I'll just go roast some marshmallows and see you...someday. P.S. I've also been terrible about visiting your blogs and will do so soon. 1 robot laden Michael Bay explode-a-ganza. 3 of these films were followed by free parties. Took hundreds of photos, some of which I may upload someday. Keep in mind that I was working full-time all along as well. I will start crying if I list all of the things I needed to get done, but either didn’t or have not even started. I'll think about that after The Hollywood Bowl tonight.